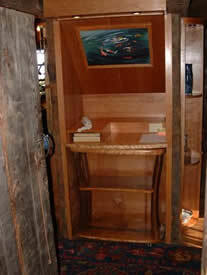 Profiles In Wood, Inc . can make use of unused space by building custom furniture. In the following example, the customer gained a book case, wine cabinet, lighted display, credenza, lighted secretary table and a butler station. 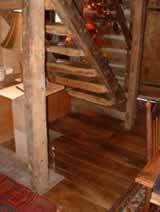 We started out with an open stairway. 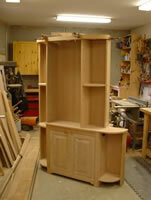 and then brought to thehome.Here you can see the wine cabinet taking shape. 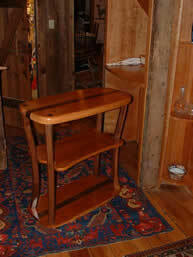 The owner loves cherry and many of the boards usedfor this piece were also cut from the property. The trick to these units is to make them able to come apart so they can fit in the door! Here is the first unit installed. 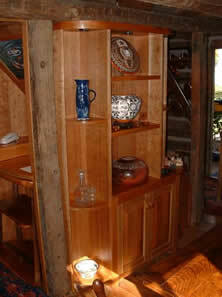 The cabinet has a stepped side so that the view to the dinning room was not blocked. 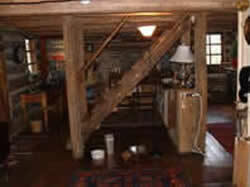 The owner's were very concerned that the furniture not overwhelm the space. The approach here was to add functionality but not reduce the feeling of openness. The second unit goes in and it really looks sharp with the owner's wonderful art pieces. The shelves are 10" wide to save space in th e dining room but the door cabinet below extends well into the space under the stairs. These pieces have 4 coats of hard lacquer, then buffed with 000 steel wool, then waxed. No stain is used because hand pick cherry with limited heartwood will patina to a natural aged finish. The secretary/butler station is the last unit to go in. The local cherry has tiger stripe sometimes seen in maple. The table slides neatly under the secretary. The gentle curves of the walnut legs were taken from the owner's signature style of free form design.Just a quick look at before and after. The cabinet looks like it was there all along. No comprise of openness but increased function. 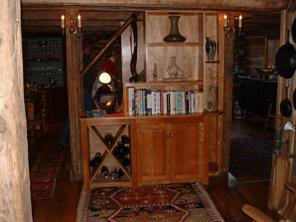 Let Profiles in Wood tackle your space problems! Contact us today!